Naruto 611 is now available! up next, the Juubi was just revived during the previous chapter. Kurama and Hachibi started to attack the Ten Tails but it’s just too powerful. It didn’t even unleash its powers yet, all it did was deflect and threw back what Kurama and Hachibi threw at it. Kakashi used Kamui to teleport Hachibi right on top of the Juubi’s head so that Hachibi can deliver Bijuudama right on the Juubi’s bulging eye. Will they succeed with their plan? Find out in Naruto chapter 611. UPDATE: Naruto 611 is now available! This chapter is entitled Arrived. You can begin reading this chapter online. Who do you think has “arrived”? Could it be Sasuke? Find out. The previous chapter was an epic chapter. A battle between the two strongest tailed beast, Kurama and Hachibi, vs the Juubi. Naruto tries to measure the power of the Juubi but it was just to powerful for him to measure it. Just like what Kurama said, the Juubi’s power is immeasurable. Kurama made the first strike but was easily deflected by the Juubi with just one blow. Kurama and Hachibi then tries to attack it with a continuous Bijuudama left and right, but it just threw back the Bijuudama at them. One of Hachibi’s leg was thrown by Naruto perhaps to serve as a diversion so that Kakashi can use Kamui on Hachibi. Naruto and Kakashi jumped right on top of the Juubi’s head, Kakashi then released Hachibi, and Hachibi delivers a Bijuudama right on top of the Juubi’s eye. 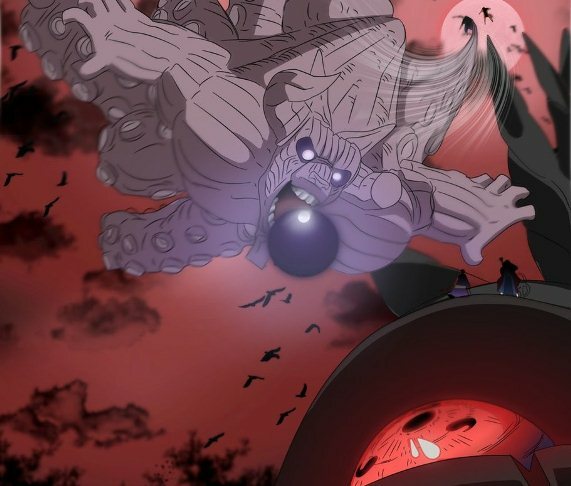 Of course Obito and Madara will get hit since they are sitting right on top of the Juubi’s head. What do you think will happen next? My prediction for Naruto chapter 611 is that most probably their plan will not succeed. Even though the Juubi is really big, I think it can move fast. Most probably it will deflect Hachibi’s attack or it will just absorb it. Besides Madara is still there and he is very much capable of deflecting that attack. It’s not the climax of the battle yet. I’m sure we will see a lot more of fighting action between the Tailed beasts and the Juubi. And were the heck is Sasuke?! Naruto 611 spoiler will be posted in this section. Most probably the spoilers or raw scans are released one day before the chapter is released. I’ll update this post once Naruto 611 spoiler is released or when the chapter is released. But honestly, I’m really positive that the Juubi will somehow deflect or dodge or even withstand Hachibi’s attack.. Stay tuned!